Baking and Mistaking: Chocolate Chip Cookie BAM! Ah, this is a recipe for all you non-bakers out there: simple, sweet and delicious! The recipe comes from the Food Network website, and its actually from Emeril Lagasse! Who knew Emeril baked?? 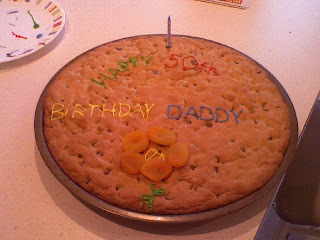 Not me - I'm not sure how you could kick a cookie up one notch...well I supposed baking it in a pizza pan would do it! Yeah, you're probably wondering about the apricots...Well, my Dad is a big fan, so I figured, why not put them on! 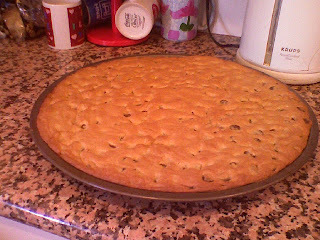 Anyway I followed the recipe exactly, but I left out the white chocolate chips and nuts, just using semi-sweet chips. It was really tasty and went fast. Plus it just looks so adorable. Tip of the Day: For easy clean up, line your baking sheets and dishes with parchment paper before baking. Add in the eggs one at a time until well mixed. Add in the vanilla. Gradually mix in the flour, baking soda and salt. Press into a foil-lined and greased 14-inch pizza pan. Bake on 375 F for 20 to 25 minutes until golden brown on the edges. Cool in pan 10 minutes then remove to wire rack to cool completely.